Louis Audenreid Professor of History, Emeritus, at Franklin and Marshall College, Lancaster, Pennsylvania. This book is a revised version of Dr. John Joseph's "The Nestorians and Their Muslim Neighbors, a study of Western influence on their relations", originally published by Princeton University Press in 1961. The author's scholarly research and description of the history of Modern Assyrians enlightened this Assyrian reader. It is not my intention to embark on a task of blind criticism nor it is an attempt to undermine the noble efforts of the author. However, it is hard to suppress ones nationalistic sentiments whenever our true identity is at stake. Nonetheless, I would like to shed some light on what it is believed to be of interest to most Assyrian readers, i.e., the linkage, or lack there of, of the Modern Assyrians to the Ancient Assyrians. While acknowledging the author's vast knowledge in Middle Eastern studies and dare not challenge the historical facts and hypothesis in regard to the origin of modern Assyrians, I am prepared to engage into an intellectual debate on our national identity. There are other Assyrian scholars including Dr. Edward Y. Odisho who have come out in the defense of the linkage in a scholarly and analytical manner. "To be the native of a land for more than three millennia and yet to have the authenticity of one's nativity questioned or even denied is the most flagrant violation of one's human rights", (Dr. Odisho's presentation at Melammu Symposia, Helsinki 2001). "…… this study was a practice in scientific research aimed at making judgements that are fairer and more objective…". "What nationality are you?" The missionary asked. "Assyrian!" The boy replied. "Assyrian? Those ancient people became extinct thousands of years ago. To believe your claim, you must provide me with proof" the missionary pulled his passport and pointed to his identity as an American and said, "This is my proof. What is yours?". "I am Assyrian because my father told me so. You know my father never lies" the child exploded, his eyes gleaming with confidence. "Who told your father that he was Assyrian" the missionary asked. "His father" and "His Grandfather told his father" the boy went on and on repeating those words." 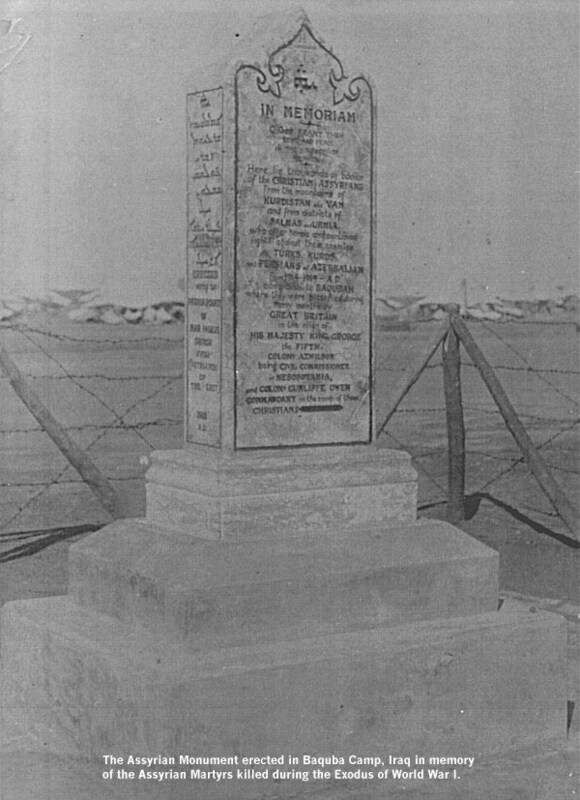 "the story of how thousands of these refugees suffered and died; how they were reluctantly received but humanely treated and brought to Iraq by the British has often been related. 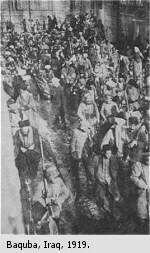 One reason why they were transported to Iraq was the famine conditions in Persia, where thousands of Persians and Kurds starved. That is the ugly story of war when man's natural enemies, cold, hunger, disease and fear combine with religious hatred and blind passion to overwhelm the dictates of humanity and conscience." "While the Eastern Christians and their Muslim neighbors have a great deal in common, religious differences still set them apart. Members of each faith have their own distinctive religious custom and tradition; they conduct their marriage ceremonies differently, celebrate different feast and holidays, fast and worship differently, and more importantly what each religious community holds holy is different. Because of the important role that religion plays in the social and political life of the people, religious differences between them, strengthening their self awareness and sense of ethnic identity, this being true especially among the members of the minority"
"I am grateful to Dr. Spindler for accepting also a revised title for the book. The reasons for choosing the name Nestorians in the past are given in the original preface reproduced below. The more controversial name "Modern Asyrians" is now used because of its greater unambiguity. To my surprise, there were a number of people, among them specialists on modern Middle Eastern history, who, while familiar with the "Nestorians" and with the modern "Assyrians," were still unaware that "Nestorians" of my original title referred to very same people who since the turn of the century came to be commonly called "Assyrians" in English. "the Assyrian Church of the East, is not a 'Nestorian' Church. Though Nestorius, the patriarch of Constantinople, is honored and venerated in her thought and liturgical action, the Church of the East was established in Mesopotamia during the apostolic age centuries before the birth of Nestorius". "Yet another proof" writes the author (22) "that the Aramiac speaking Christians are descendents of the ancient Assyrians argues that the language of the two people are the same. Layard wrote that the Nestorians spoke "the language of their"Assyrian' ancestors, an opinion expressed by Layard's Aramiac-speaking assistant, Hormuzd Rassam: that the ancient Assyrians "Always spoke the Aramiac language" and they "still do" We have just seen that the ancient Assyrians did not always speak Aramiac; their mother tongue was Akkadian, the language of the famed cuneiform tablets and monument that Rassam himself helped excavate." "Unlike the Assyrians, the Persians did not forget their own mother tongue" (13). The author's emphasis on disproving the belief of Modern Assyrians that "Suraye" and "Aturaye" are synonymous (17-21), is an apparent indication of his advocacy of the "lack of linkage" hypothesis. Equating "Suraye" to "Syrian" from the geographical Syria further undermines the linkage hypothesis. Based upon this logic, the Modern Assyrians who called themselves "Suraye" from time immemorial are actually "Syrians" from the geographical "Syria". This reader favors the opposing logic that the modern days Assyrians are from "Geographical Ancient Assyria" or the "Plains of Ninveveh". The hypothesis presented by the author failed to convince this reader that Assyrians of Hakkari and those living in the various villages of the Mosul plain (Modern days Chaldeans) are geographically from any other place but the Geographic Ancient Assyria. The Assyrians also spoke Aramaic, as did the Syrians from Syria. The Syrians from Syria were Arabized, therefore, forgot their mother tongue of Aramaic. The "Suraye" synonymous to "Aturaye" from the 'Plains of Nineveh" continue till this day to speak Aramaic. I am of the opinion that the author's study, despite its scholarly and impressive presentation, failed to disprove the linkage of Modern Assyrians to the Ancient Assyrians. "never been destroyed at all but had just changed ownership: first to Babylonian and Median dynasties, and then to a Persian one." The Assyrian Empire "continued to live on despite the fact that the Assyrian themselves were no longer in control of it." 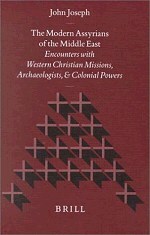 "The people who today call themselves Assyrians are, strictly speaking, members of a cultural and religious group, molded together into a minority by ties of a common language and, until the nineteenth century, a common church membership which, until the birth of the modern nation-state in Middle east, was the strongest tie among people." "but in the eyes of the majority, Western presence was foreign and oppressive. 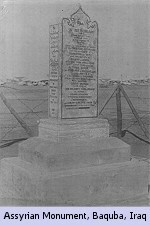 It took another World War (1939-1945) before the British and French rule came to and end, but hardly had they departed from the scene, when the Arabs were faced with a new and more permanent enemy in the Jewish state of Israel, created in the midst of the Arab-Muslim world by the departing Western Powers, joined by the United States of America. For the entire second half of the twentieth century Israel would symbolize not only Palestinian homelessness but also the powerlessness and humiliation of millions of Arabs and non-Arab Muslims (see Marin Kramer, "the Muslim Middle East in the 21st Century)…….Combined with other factors and grievances of the region, the festering Palestinian problem and the triumph of Islam in Iran, gave rise in the region to an Islamic renewal and new self-assertiveness. Among those joined the movement were the young and educated classes; as leader of the next generation, they were disillusioned with the ideologies and strategies that had failed to work out a solution for their parents (see James r. Kind "The Theme of Alienation in contemporary Middle Eastern Literature"). They longed for something different, but familiar, with native roots; uniting them was the mistrust of the West." One could only hope that the leaders and the general public of our beloved nation, the United States of America, would read this book, get an insight and be enlightened with the treasure of knowledge that the author presents in this area of constant conflicts. Acquiring knowledge in the true but rather sad history of the middle east as demonstrated in this book, would certainly enrich the policy makers of the roots and causes of terrorism by Islamic extremists so they may be better prepared to deal with it effectively. 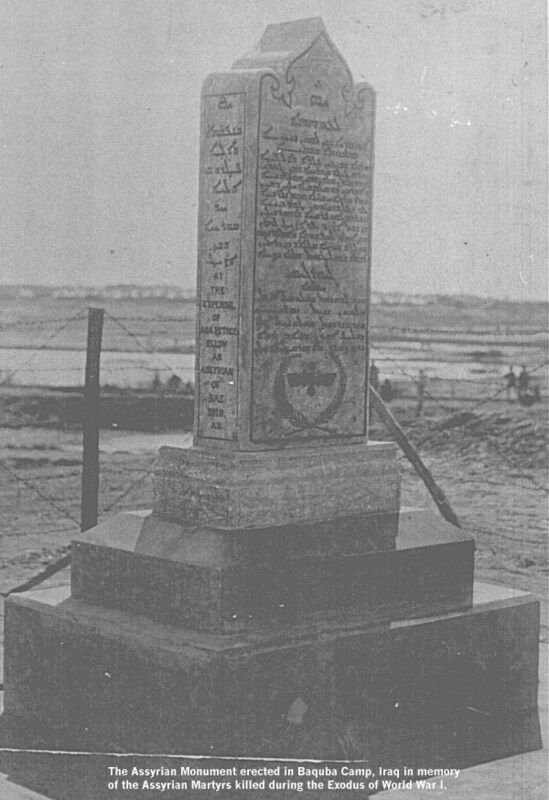 There are many zealous, but well-intentioned Assyrian nationalists, who have been critical of the author's writings. While the published work of the author has been unfairly portrayed as a betrayal of our Assyrian heritage, I must regrettably admit that the author's controversial views regarding the linkage issue open itself to valid challenges. For those of us who are passionately convinced that we are descendents of ancient Assyrians, this may not be the proper book of history, nor the author, is the ideal historian, to further prove our conviction of the linkage. However, Assyrians should learn from, be proud and respectful of our author, who has written such a scholarly book of history even though they may disagree with his conclusions. Our national identity as it has been engrained in us from time immemorial, is deeply rooted in the soul of every Assyrian. The Author's presentation of hypothesis disproving the linkage would not change the perception of the Modern Assyrians who are passionately convinced of their ethnicity. It is obvious, however, that the author’s foresight is far more reaching to the world beyond that of the Assyrian readers. May God bless the author with another hundred years of healthy and prosperous life. May God give him a relentless wisdom so he may record the "yet to unfold" history of "future Assyrians". May God lead him to the path of discovery where the Assyrians of ancient, modern and future are one of the same "Assyrian".